Italian family life can be characterized by loyalty and closeness. From the immediate, nuclear family to more extended relatives, Italians tend to remain as a close unit through several generations. Whether they are meeting in the square or at someone's house over a large dinner, family life in Italy is one of the foundations of their culture. Every Culture explains that Italians have stronger feelings of loyalty to their family than they have to their country. Even though there is increasing migration with some families geographically separated, the family is still the center of the social structure providing unity and stability. In the South, extended families often live together, but in the North, you are more likely to find nuclear families. In both cases, the grandparents take an active role in helping with childcare, especially when both parents work. Children are watched over carefully and trained to be loyal and obey their parents. Every Culture describes how children are coddled while very young but are expected to help as they grow older. They are given jobs to perform within the family, especially in rural areas where they are expected to help out with chores and run errands. This is not so evident in busy cities where parents' work does not relate to the home. Respect for the elderly is demanded. For example, children give up their seats and enter the room after adults, and they are at the beck and call of elderly family members. A large part of an Italian family's social life involves eating and celebrating together. They meet in bars, pizzerias and restaurants, and frequently share meals in the home. This love of food conforms to the traditional vision of the Italian family. Industrialization and modern city life mean that parents work office hours, so for Northerners, the midday meal is lighter and taken outside the home. 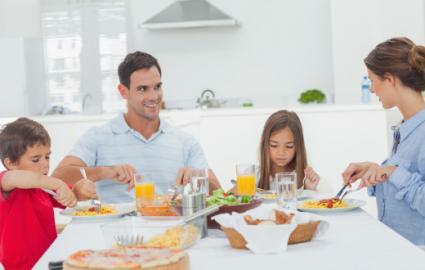 The larger family meal takes place in the evening. According to Professor Russel L. King, other popular leisure activities Italian families like to indulge in are: TV, radio, reading the newspaper and cinema. They are not so keen to participate in sports or read books. Italian architecture, with its many piazzas, encourages families to go out onto the streets, especially during the spring and summer. In rural communities, the village square is a place for meetings between families. City folk also walk out in the evening and as Tricia Senior shows in her video, the streets of major towns and cities such as Rome are filled with garrulous Italians shopping, eating and drinking together. Celebrations occur frequently, so there are many occasions for Italian families to get together. According to Culture Crossing Guide, 90% of Italians are Catholic. There are so many patron saints that Italians could celebrate every day of the year. Families do not attend church as frequently as they used to, but busy families share Sunday lunch and Catholicism still provides a moral structure. Italian families also celebrate secular holidays, such as the Anniversary of the Republic on June 2, and Independence Day on March 17. Typically women who work outside the house also take on the traditional roles of housework and child care as well. Still, with the lower birth rate, increased financial independence of women, and acceptance of divorce the situation is changing. Amongst Europeans, Italian women are recognized as more liberated than their counterparts in other countries. The role of the man in younger families is less patriarchal, and the woman is no longer considered tied to the home and kitchen. Another development is in marriages. In the past, traditional church ceremonies were popular. Today, civil weddings are becoming more frequent. particularly in towns, and many couples choose to live together rather than marry. According to Italy-Marriage and Children, people are marrying later, with an average age of 27 years for women and 30 years for men. This is due to the increased cost of education, unemployment and the economic situation. Although traditional lifestyle is breaking down under the strains of modern life, family life in Italy still contains the seeds of past culture. This is especially true in the South. Family ties are respected and Italians spend much of their time enjoying the company of their relatives.